THE FIRST AND ONLY BOOK ON ONE OF THE WORLD’S BIGGEST SELLING BANDS Spewed forth from the loins of mid-1990s southern California, System of a Down have evolved from a cult band whose demo tapes swapped hands voraciously on the metal underground to one of the world’s biggest acts. Relentless early gigging spread a word-of-mouth hype around them that soon created major label interest and the gold-selling eponymous debut album. Despite their ultra-hard music and dark undertones, SOAD have always managed to break out of the underground. Show-stealing support slots with Ozzy Osbourne and Slayer propelled the band to new heights, but it was their second album, the seminal Toxicity, that turned SOAD from an underground phenomenon into a mainstream smash. 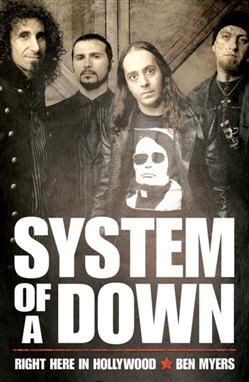 After the release of their globally acclaimed hit album Mezmerize, SOAD had shifted in excess of 25 million albums. With exclusive new interviews with the band and major players involved in their story; Ben Myers’ book will be the first and the definitive account of this remarkable band. Acquista System of a Down - Right Here in Hollywood in Epub: dopo aver letto l’ebook System of a Down - Right Here in Hollywood di Ben Myers ti invitiamo a lasciarci una Recensione qui sotto: sarà utile agli utenti che non abbiano ancora letto questo libro e che vogliano avere delle opinioni altrui. L’opinione su di un libro è molto soggettiva e per questo leggere eventuali recensioni negative non ci dovrà frenare dall’acquisto, anzi dovrà spingerci ad acquistare il libro in fretta per poter dire la nostra ed eventualmente smentire quanto commentato da altri, contribuendo ad arricchire più possibile i commenti e dare sempre più spunti di confronto al pubblico online.